Maharashtra may soon have to pay for their electricity in advance. On January 7, the Maharashtra electricity regulatory commission approved the state-owned power distribution company’s plan to launch pre-paid electricity meters on a pilot basis. To begin with, the prepaid meters would be installed in the houses of the power company employees. The meter comes with a smart card that can be recharged at sales centres. When the card is inserted into the meter, the energy purchased is transferred to it. The display unit indicates how many power units a household consumed and the balance. The meter alerts the consumer when 75 per cent of the energy credit has been consumed. If it not recharged, power supply is automatically cut off. The regulatory commission has asked the distribution company, msedcl, to prepare a detailed report on the advantages and disadvantages of prepaid metering by studying cities in India and abroad where they are in use. The report would be submitted by February, following which the commission would hold a public hearing on introducing prepaid meters. The msedcl wants to introduce the meter as it would save money needed to maintain staff for meter reading, raising bills and keeping track of defaulters. In its submission to the regulatory commission in December 2009, msedcl said the savings will enable the power company offer five per cent rebate on every purchase of electricity credit. Consumer groups and research agencies welcome the move. “The meter would cut down the transaction cost, but five per cent discount is too less. It should be at least 7.5 per cent,” said R B Goenka, coordinator of energy cell of Vidarbha Industries Association in Nagpur. Goenka said the meter would help msedcl avoid cash crunch as it would receive payments in advance. Pune non-profit Prayas (Energy Group) said prepaid metering would reduce billing errors. “It is a new concept in India and msedcl should win people’s confidence before implementing the scheme,” said Shantanu Dixit of Prayas. He said prepaid meter would particularly benefit small consumers as they can purchase electricity credit on a weekly basis and track consumption. 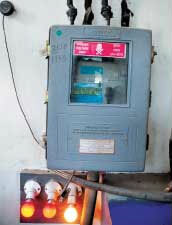 Efforts to introduce similar meters for water supply to unauthorized slums in December 2007 were abandoned following protests (see ‘Controversy over water tariffs in Mumbai’, Down To Earth, January 15, 2008). msedcl harps on the success of prepaid metering system in South Africa. But media reports say Johannesburg high court declared the forcible installation of prepaid water meters as unlawful in 2008. Activists there now demand removal of prepaid electricity meters in poor areas.